It was another week of turkey this week and I was much more organised with the meals, having all the ingredients on hand does make it so much easier. I didn't get any turkey curry recommendations so I went with another recipe from the British Turkey recipe index and there were a few to choose from too. I picked a korma, it had a lot of cream in it. One thing that is quite useful on the British Turkey website is that it shows nutritional content per portion for the each if dishes too. The korma has 510 calories and 21.7g of saturated fat. I don't think it was really what nutritionist Azmina had in mind for the turkey switch but it's not all cream the sauce is also part coconut milk, I'm not too sure that makes much difference but it a was wonderfully rich dish. We had another creamy turkey dish this week but this time the creaminess came from half fat crème fraîche. Turkey and cream go well together, so switching out double cream for half fat crème fraîche is a much lighter option that means you can still enjoy the creamy texture. This is what Azimia meant by finding healthier ways to still enjoy the foods that you like. A portion of the turkey with hot mushroom sauce was 237 calories and 2.4g of saturated fat. The turkey switch isn't about calorie counting but after my nutrition makeover it is something I've been more mindful of and the two dishes do make for an interesting nutritional comparison. The turkey with hot mushroom sauce was a bit on the spicy side for me, next time I'd half the chilli but I can't fault it, it is called hot sauce and that's just what you get. 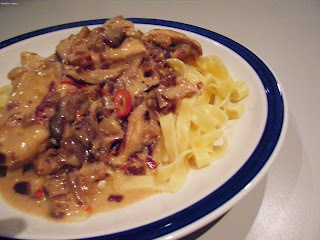 There is a little bit of sherry in there too which stops the sauce being too think and claggy. Eating turkey twice a week has meant I've had to collect a fair few new turkey recipes and I think that's been the best part of the challenge. I really enjoyed the hot mushroom sauce and after a few tweaks to reduce the level of spice, it will be a new recipe that I'l be adding to my repertoire.